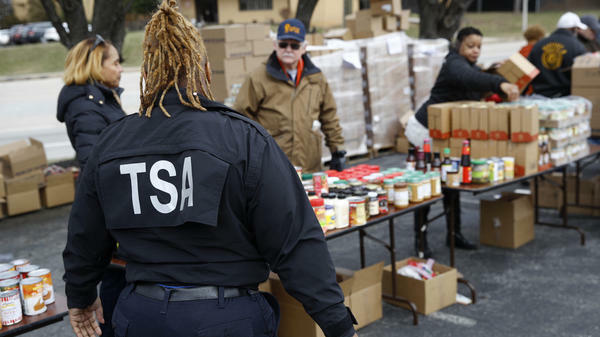 A TSA employee visits a Baltimore food pantry for government workers affected by the federal shutdown. Senate Majority Leader Mitch McConnell, R-Ky., and Senate Minority Leader Chuck Schumer D-N.Y., met to discuss the proposal. But later Thursday evening, a spokesman for Schumer said, "Sen. Schumer and Senate Democrats have made clear to Leader McConnell and Republicans that they will not support funding for the wall, prorated or otherwise." White House press secretary Sarah Sanders released a statement saying that the White House had already made it clear to Graham that a three-week bill "would only work if there is a large down payment on the wall." Speaking to journalists Thursday evening from the White House during an event about trade, Trump said he was open to a compromise with Democrats that reopens the government if it includes a "prorated down payment" on the border wall that has been the sticking point in the ongoing funding impasse. But no breakthrough appeared to be imminent, based on the president's comments. The president said he is open to whatever results from the discussions between McConnell and Schumer, but Trump would not commit beyond a broad statement to assess what the Senate leaders announce. "It depends on what the agreement is," the president said. "If they come to a reasonable agreement, I would support it." Trump also restated how important he thought a permanent barrier on the Mexico border is to prevent what he called the smuggling of drugs and humans through "wide open spaces" where no such barrier stands now. He acknowledged that much of the contraband smuggled into the United States arrives at major ports of entry, but he said, "The big stuff comes through the areas where you have nobody watching." Despite Trump's apparent willingness to entertain a short-term deal that would reopen the government, Democrats in Congress have been resistant to supporting any funding that would go toward construction of a wall or other barrier on the border with Mexico. The Senate votes followed by a renewed effort to find a deal came on Day 34 of the partial government shutdown, which has left some 800,000 federal employees without their second straight paycheck — which many would have received Friday. The first vote, on a proposal by Trump to provide $5.7 billion for a border wall as well as changes in immigration law, received 50 votes in favor, with 47 senators voting against it. Republican Sens. Mike Lee of Utah and Tom Cotton of Arkansas voted against the GOP measure while Democratic Sen. Joe Manchin of West Virginia voted in favor. The second proposal, sponsored by Senate Democrats, would have provided for two weeks of operating money for the government but included no funds for a wall while discussions on border security continued. It received 52 votes in its favor, and 44 senators opposed it. Six GOP senators supported the Democratic bill: Susan Collins of Maine, Lamar Alexander of Tennessee, Mitt Romney of Utah, Lisa Murkowski of Alaska, Johnny Isakson of Georgia and Cory Gardner of Colorado. As a group of freshman House Democrats visiting the Senate chamber looked on earlier Thursday, tempers rose during the Senate debate. Sen. Michael Bennet, D-Colo., lashed out at Sen. Ted Cruz, R-Texas, who instigated a previous shutdown over funding for the Affordable Care Act, also known as Obamacare, during the Obama administration. With his arms crossed, Bennet accused Cruz of "crying crocodile tears" over the current lack of funding for first responders, including the Coast Guard. "When the senator from Texas shut this government down in 2013, my state was flooded," Bennet said. "It was underwater!" Bennet continued. "People were killed! People's houses were destroyed! Their small businesses were ruined forever! And because of the senator from Texas, this government was shut down for politics." Earlier, House Speaker Nancy Pelosi, D-Calif., threw cold water on reports that Democrats were working on a deal to fund border security but not a wall. At a Thursday morning news conference, she said Democrats were not engaging in behind-the-scenes planning of an offer. "We are prepared to spend a very substantial sum of money because we share the view that the border needs to be secure," Hoyer said. "The letter is going to articulate what we believe is an effective investment to accomplish border security." Trump wants $5.7 billion for the wall, and the Democrats' proposal could exceed that amount. Appearing on NPR's Morning Edition, White House Director of Strategic Communications Mercedes Schlapp did not immediately rule the idea out. "Why don't we have the Democrats come over and propose that over to the president?" she said. "What we need is a conversation." But it's not clear whether Trump would sign off on the offer. Several conservative leaders who met with Trump on Wednesday to discuss immigration policy and strategy told NPR that the president had resolve and believed the ball was in Pelosi's court. "You don't negotiate against yourself, and that was a clear message," said Ken Cuccinelli of the Senate Conservatives Fund. As for a strategy following the failed Senate votes, these conservatives said the White House was looking to peel off or win the support of moderate Democratic House freshmen who were elected last November in traditionally Republican districts. But that has been a White House strategy for more than a week, with few signs of defections. There was no sense coming out of Wednesday's White House meeting that the partial shutdown would end anytime soon. "We're out of the mentality that this is a sprint," said Cuccinelli. Roughly 800,000 federal employees are affected by the shutdown. Many will miss their second paycheck this week. Food pantries have been set up in several cities for the workers. In an interview on CNBC on Thursday, Commerce Secretary Wilbur Ross said, "I don't quite understand why" federal workers are going to food banks, suggesting they apply for loans to make ends meet until they receive back pay. "There is really not a good excuse" for why the affected workers face what Ross termed "a liquidity crisis." In his remarks from the White House on Thursday, the president defended Ross though he said he hadn't heard Ross' actual remarks. "But I do understand perhaps he should have said it differently," Trump said. The president continued: "Local people know who they are, where they go for groceries and everything else, and I think what Wilbur was probably trying to say is they will work along. I know banks are working along, if you have mortgages, the mortgagees, the folks collecting the interest and all of those things, they work along. And that's what happens in time like this. They know the people, they've been dealing with them for years, and they work along — the grocery store — and I think that's probably what Wilbur Ross meant." "He's done a great job, I'll tell you that," the president also said about his commerce secretary. Pressure to resolve the shutdown also came from an unexpected source: former White House chief of staff and former Homeland Security Secretary John Kelly. He and four other former DHS secretaries wrote a letter to Congress and the president urging them to end the shutdown. "DHS employees who protect the traveling public, investigate and counter terrorism, and protect critical infrastructure should not have to rely on the charitable generosity of others for assistance in feeding their families and paying their bills while they steadfastly focus on the mission at hand," the former secretaries wrote. "This is unconscionable."